SkyView at Fall River Village is a world-class wedding venue in Estes Park opening early summer 2018. This venue will be set apart as a top choice for couples because of it’s premier location, spectacular scenery and modern ambience. Here is what we love best about our new venue and we’re sure you will too! Panoramic Rocky Mountain views will accentuate your wedding day celebration. Our venue truly makes the most of the scenery by naturally incorporating the mountains with grand windows and open-air features. Your wedding will be the only event that day, guaranteed! We pride ourselves on providing excellent customer service and memorable guest experiences. You can customize your whole wedding! We allow you the freedom to choose your own licensed caterer and vendors, so you can make your wedding as unique as you are. No contingency plan needed – Our rooftop ceremony space has an open-air canopy which will provide shelter in cold weather or shade from the sun. Our reception space will have glass doors and grand windows, so weather won’t inhibit your mountain wedding experience. We can take care of all your guest accommodations – You can give your guests a vacation of their own! With 3-4 bedroom luxury mountain townhomes and 60 riverside two bedroom condos, Fall River Village can host your entire wedding. Our prime location is walking distance to downtown Estes Park’s shops, restaurants and bars; allowing for a laid-back feel and convenience for your guests. 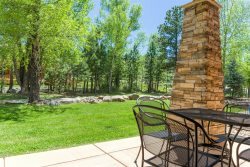 You and guests can enjoy all that Estes Park has to offer during their trip. Inquire about your SkyView Wedding Today! Rooftop Ceremony - Longs Peak and the Continental Divide will be your ceremony backdrop, making your wedding celebration unforgettable! Best of all, our open-air roof canopy allows for nothing (rain or snow) to come in between you and your special day. Open-Air Reception - Our rustic, modern venue truly invites the outside in. Guests can enjoy cocktail hour on the wrap-around viewing deck, then be welcomed into our reception space, where the surrounding glass doors provide unrivaled mountain views. Your Epic Wedding View - You can be one of the first to have epic wedding photos featuring you, your love, the greatest day of your lives, the Continental Divide and the infamous Colorado 14er, Longs Peak! You may even be able to see some wildlife! It can’t get much more amazing than that. Whole day exclusive use of the Event Center for up to 110 guests. Event setup starting at 10 am. Rooftop ceremony space can be enjoyed until 10 pm. Event cleanup: 1 hour following event, no later than 11 pm to 12 am. Site use for photography session. Fall River Village digital image release for wedding papery and wedding website. and must be confirmed 30 days prior. brunch. This is based on availability and must be confirmed 30 days prior. Facility management during the event. 1 complimentary honeymoon suite for the night of the wedding. Customized setup of the tables and chairs for ceremony and reception (Caterer sets tableware, clears and provides event cleanup). Your choice of full-service licensed caterer. [Barware will also be contracted with the selected catering company]. Recommendations for preferred local vendors. Base linens (ivory tablecloths and gold napkins). Dance floor (interior use only).